I have many childhood memories of visiting Scarborough on holiday so it was with a little nostalgia that we visited for a day this Summer. Scarborough is an example of a traditional British seaside town which has managed to move with the times whilst keeping much of it’s original character and attractions from my youth. Fortunately it’s managed this without gaining the stag / hen night culture which spoils the family atmosphere at Blackpool. There are numerous car parks around Scarborough, but we chose to park on the seafront parking spaces in the North Bay area. This is a pay-and-display parking zone starting on the road after the harbour at South Bay until the road turns in-land at the top of North Bay consisting of Royal Albert Drive and Marine Drive. We were fortunate to get spaces near the North Bay beach area, it can be a substantial walk to some of the spaces further down. The distance between North Bay and South bay is substantial and one of the best ways of travelling between the areas is using the open top bus services. There are two different operators that run along this route so you need to check that you are getting on the correct bus if you have purchased a day ticket. 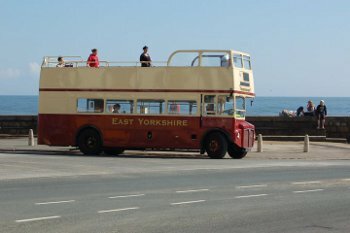 The bus operators are: Shoreline Sun Cruisers and East Yorkshire Motor services. Shoreline Sun Cruisers also run an additional service collecting at Peasholm Park when the Naval Warfare finishes which was convenient for us. The other services (some with the distinctive bow ties on the front of the buses) is provided by the same operator as the regular public bus services. There is a sandy beach at both the North and South Bays. The South bay is more sheltered from waves out at sea and so usually has a calm sea. Parts of the North beach are also sheltered, but there can be large waves which are popular with surfers and also allows Jet Skis. The south bay is usually busier and often has donkey rides and sand sculptures. Both beaches are good and it depends upon what you want to do which you prefer. Despite the crowds I’d probably go for the south bay with young children. The south bay has numerous amusement arcades, attractions and shops along the sea front. There is also a fun fair at the side of the harbour with a few rides for young and old. The kids had sausage and chips from one of the fish and chip shops and I had a crab sandwich from one of the sea front kiosks near the RNLI Lifeboat Station. There are toilets near the harbour (small charge) with a baby changing room (free of charge), but there was no nappy bin in the baby changing room. 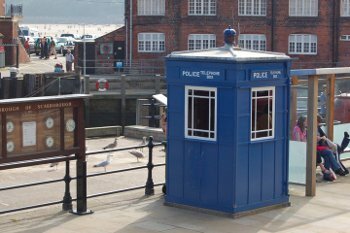 The rear of the toilet building can be seen on the photo with the Police Box above. Peasholm park is near the North Bay. It is free to enter the park which is designed around a Japanese oriental theme. 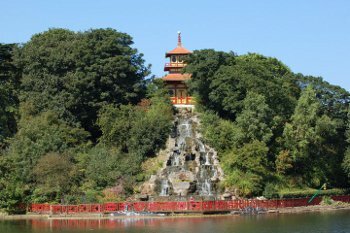 The park includes a boating lake around a central island with pedaloes or canoes to hire; or a swan boat for those that prefer someone else to do the driving. Unfortunately the Tree Walk Wonderland which I remember from my childhood has gone, but the island is accessible by a refurbished footbridge, although we didn’t explore the island when we visited this time. The park is well known for it’s Naval Warfare battles featuring manned model boats and pyrotechnic explosions. These have been going for over 80 years and are still popular today. The shows take place during selected weekends between May and September starting at 3pm. Admission to the viewing area is &pound3 during the show (pay on entry). Scarborough Castle is a prominent feature on the skyline standing high above the rest of the town. The old waterpark has closed down and has now become a lazer fight / paint ball site with tank rides. There is a Sealife Centre at Scarborough, but in all my visits I’ve not had the time to be able to see it. 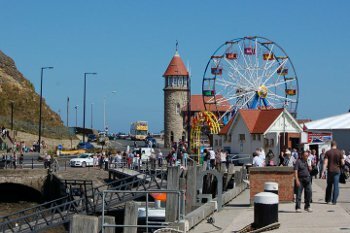 Scarborough is a great example of a British seaside resort that is still going strong despite the competition from overseas holidays. A great place to take the kids for a day-out, weekend or week long holiday. This entry was posted on Friday, September 10th, 2010 and is filed under Babies, Children, Days Out, Family, Holiday, Tourism. You can follow any responses to this entry through the RSS 2.0 feed. Both comments and pings are currently closed.